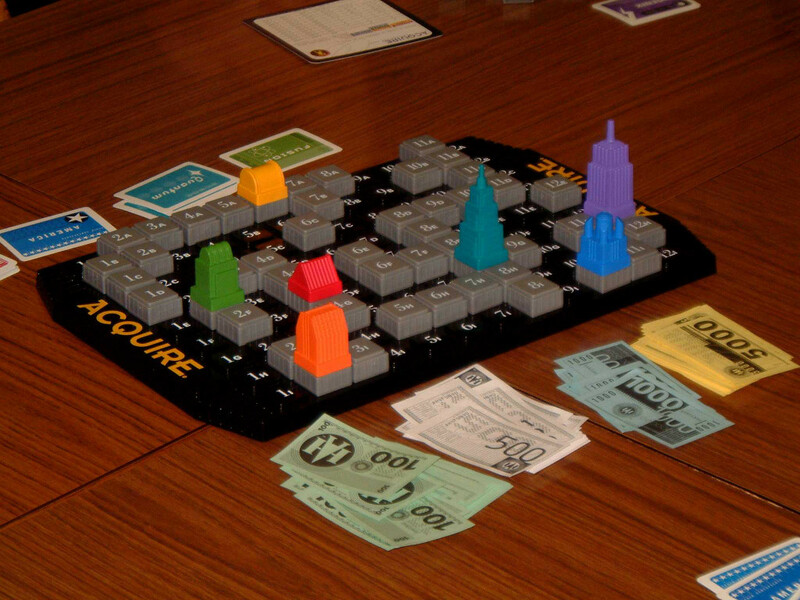 Acquire first appeared in 1962 and is the oldest game that gets still gets regular play at the club. 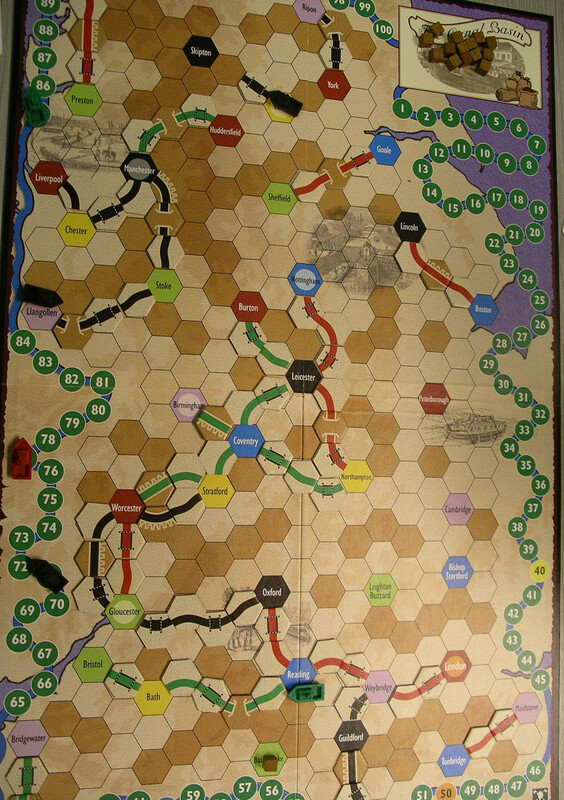 In the game the players are investors in chains of Hotels (or generic corporations in the 1999 edition) and on a turn they must first place a tile on the board. If that tile creates a grouping of 2 or more tiles, a chain is formed and further tiles connecting to that grouping increase the size of that chain. If a tile joins two or more chains, then a merger takes place with the larger of the chains taking over the smaller. After playing a tile and resolving any merger, the player may buy up to three shares in available chains and then draw a replacement tile. Players in this game must be wary of using all their money money is only received when a merger occurs. When this happens then the holdings of the players in the chain taken over is checked and the largest shareholder receives a payout depending on the size of the chain, the second largest shareholder receives half that amount. After that the players must dispose of their shares, either selling at the price they had before the takeover, converting to shares in the chain taking over or retaining them in the hope that the chain is reformed. The game can be ended on a player's turn when all chains are safe (size 11 or more) or a single chain has reached a size of 41 or more. When this happens shareholders receive payouts for each chain they hold shares in as if it had been taken over and all shares are sold at current prices. Whoever has the most money at that point is the winner. "'Age of Industry' is a development of the highly rated Warfrog game 'Brass'. This is a pure business game, when you must seek the most efficient way to make a profit. By investing in a variety of industries you will make money to invest in more advanced ones. You must judge the market conditions well to determine which industries will give you the best return. Cotton and factories will certainly earn you money, but if you ignore coal mining and producing iron then you may be allowing another player to earn profits from your activities. You also have to consider whether to build ports to increase your profits from selling, and whether to invest in ships to open up new markets." - Back of box. â€œAmun-Re is played in ancient Egypt in the time of the pharaohs. The players take the roles of rivals and, during the game, the players use their resources to take control of provinces and build pyramids in them. When each player has taken control of 3 provinces, the time of the old kingdom comes to an end and the players score their positions. The players score points for what they have built, especially for completed pyramids. Afterwards, the players clean off the game board, leaving only the pyramids and building stones. Then, the players begin the second half of the game with the new kingdom. The game continues as it did in the old kingdom. At the end of the game, the players score again and the player with the most points is the winner!â€� â€“ Rio Grande Games English rules. Another game well played at the club since 2003. 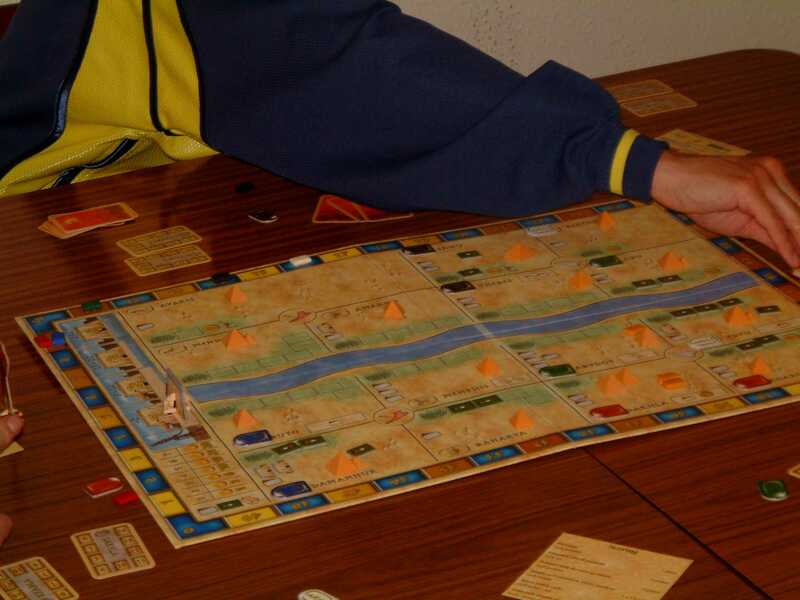 This is a Victory Point game played in two phase corresponding to the old and new kingdoms of ancient Egypt. In each there are three rounds in each in which players buy provinces and build pyramids in them hoping to score points for possession of pyramids and also buy fulfilling the requirements of power cards that are gained during the game. In each round there is also a sacrifice (auction) with players bidding to gain the most favour with the God, the total bid by all players determining the amount gained from the harvest and also the value of temples in some provinces, if it is a scoring round. â€œANTIKE is a challenging strategy game about the evolution and competition of ancient civilizations. 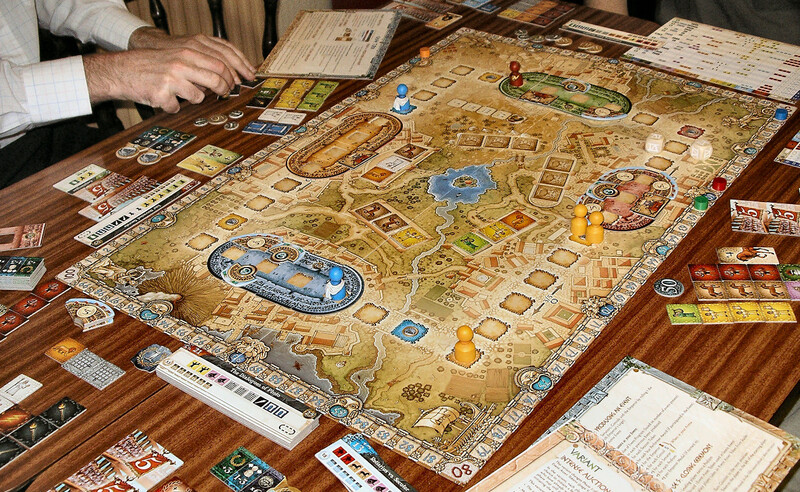 The name of the game in German means "age of antiquity". Ancient nations found cities, erect temples, sail the seas, do battle, and make scientific progress. Their legions and galleys open new regions for settlement, and defend against the enemy. For action in two different ancient operational theaters, players choose a nation from among the Greeks, Romans, Germanic tribes, Phoenicians, Carthaginians, Persians, Arabs, Egyptians and Babylonians. â€œThe Cylons were created to make life easier on the Twelve Colonies. And then the day came when the Cylons decided to kill their masters. After a long and bloody struggle, an armistice was declared and the Cylons left for another world to call their own. Humanityâ€™s only hope lies in finding Earthâ€™s location while fighting off the unrelenting Cylons. But as resources run low, it is discovered that the enemy can now appear human and has infiltrated the fleet from the inside.â€�- Fantasy Flight Games English rules. This is based on the â€œreimaginedâ€� TV series Battlestar Galactica. The players take the roles of characters from the series and are set the task of cooperating to ensure that the remnants of the human population can make their way to the planet Kobol, where they may find clues to the lost planet Earth. In this they are opposed by the Cylons in the form of the game system and also in that 1 or 2 of the characters are secretly Cylons, who will seek to defeat the human cause by reducing a resource to zero or by destroying the Galactica either by space attack or by succeeding in getting a boarding party to the Armoury. This is a team game, although it will not be apparent who is on which team at the start of the game and players win or lose as a part of their team rather than individually. "Canal Mania recreates the growth of the English canal system during the late 18th and early 19th centuries. 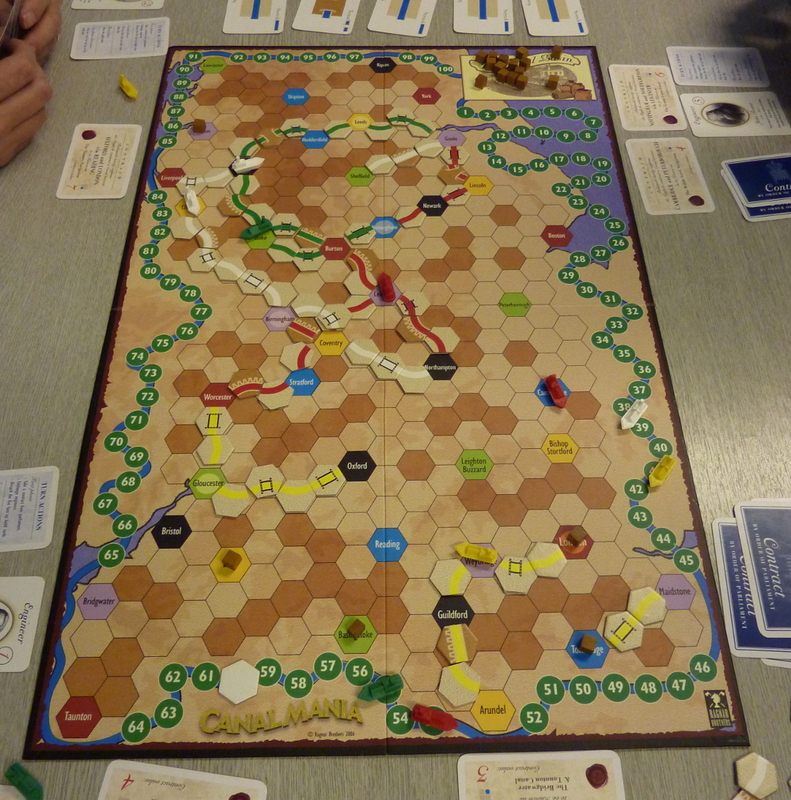 Players collect points for building locks, aqueducts and tunnels, for completing canal-building contracts and for moving goods during the course of the game. The winner is the player with the greatest points total at the end of the game. "- Ragnar Brothers English rules. During each turn players acquire contracts specifiying which towns or cities they must build canals from to, possibly with a requirement to build via a third town or city. Canals are built by playing cards to allow the placement of hex tiles on the game map showing lengths of different kinds of canal construction and points are scored for different kinds of construction and for the completion of contracts. During the game, goods will appear on the map and once lengths of canals are complete, players may use them to move one good a turn to a linked city, gaining points for the number of towns on the route linked by lengths owned by the player. Other players may also score points at this stage, if the movemnt also passes along canals built by them. This is the card game version of the board game Caylus following the same pattern as the original game except that the "board" is built up using cards as the game goes on.